Over a period of more than 4500 years, people in different parts of the world built huge pyramids. The oldest Egyptian pyramids were started almost 4600 years ago, while the youngest pyramids in Central America were finished about 600 years ago. Each one took a long time to build, sometimes over 50 years, and involved thousands of people. Why did these civilizations opt for a pyramidal structure rather than a cube or a rectangle for their monuments? These experiments will help you to find out. In the first, by changing a cube into a pyramid, you end up with a structure that is three times taller than the original cube. A pyramid makes good use of material, by making the structure as high as possible. The second project shows that triangular shapes are more rigid than squares and do not collapse as easily. When an earthquake destroyed the Egyptian city Cairo 700 years ago, the pyramids stood firm. Modern materials and technology make it possible to build tall, rectangular buildings that are strong and stable. Nonhardening modeling material, plastic modeling knife, ruler, book. Make two cubes from modeling material. The faces should be measure about 1 or 1½in, but they must all be the same. 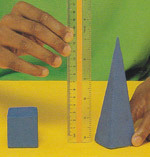 Use a ruler to check your measurements. Reshape one of the cubs to form a tall, square-based pyramid. Its base must be the same size as the original cube. You now have a cube and a pyramid. Now measure the cube and pyramid. They have the same volume and the same size base. The pyramid is three times taller, but is strong and more stable. Make the cube into a long slabs. Place the slab and the pyramid on a book. Slowly tilt the book, to imitate the effect of an earthquake. The slab topples over before the pyramid does. Make another smaller cube and pyramid from modeling material. Make sure that they are the same height. Their bases must also be the same size. Do the same book test with the two smaller shapes. You should still find that the pyramid is the more stable of the two shapes. It is the second of the two shapes to fall over. For this project, you will need two models – a cube and a square based pyramid. Make them out of large plastic drinking straws and reusable adhesive. First, make the cube. 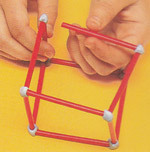 After fixing four straws to make the base of your cube, you need eight more to finish it. Make sure that your cube is even, with each face the same size. Now make a square-based pyramid. The base should be the same size as the base of your cube. Make the base, and just fix four more straws to it to complete your pyramid. Push down gently with your hand over the center of the cube. Move your hand slightly to one side as you push down, and you will feel the cube start to collapse. Repeat this with the pyramid. You can feel how much more rigid this shape is, and it does not collapse. This is because a pyramid has triangular-shaped faces that meet at a central point.